Just as America’s “World Series” insults the rest of the baseball-playing world by qualifying only American teams, so the Oscars routinely claim to celebrate “Best Pictures” while going to extremes to block the art produced by the rest of the world. In the interest of helping you plan some extraordinary movie nights, Response offers a list of 10 excellent 2009 movies from the world that the Oscars forgot. Buckle up. We’re going on a trip around the globe. In part 1, we’re starting with a few films from Europe. If you peruse the list of 2009’s most beloved films around the world, three of them came from France. None of them earned even a single Oscar nomination. Director Oliver Assayas’ beautiful film Summer Hours is a gripping drama about a multigenerational family struggling to decide what to do about their extravagant, picturesque estate, and the collection of priceless works of art that their mother held dear. The family’s matriarch is aging and not long for this world. As her children — now grown and married — pursue vocations around the world, who will be left to guard this gorgeous mansion? Will it be the housekeeper who watched them grow up? What is globalism doing to families and their histories? And what really makes an heirloom valuable? Exploring all of these questions, Summer Hours is ultimately about art and how art appreciation is changing in this period of global transition. That may not sound like compelling subject for a film, but it will hold your attention all the way to the end. You’ll discover a scandalous family secret, and your conscience will be put to the test as you listen to the differing perspectives in this large and impressive family. You’ll also enjoy emotional performances by a first-rate ensemble cast (including Juliette Binoche) and an ending that is so unexpected that it will make you go back and rethink the entire film. For more on Summer Hours, read my commentaries at Image and Filmwell. You can also see the movie trailer of Summer Hours. We often hear voices in Christian media complaining that compelling portrayals of Christian faith are rare on the big screen. Séraphine, directed by Martin Provost, gives us one of those faith-filled portraits. With the help of an astonishing performance by the veteran French actress Yolande Moreau, he makes Séraphine one of the most memorable and beautiful films of the year. Séraphine tells the true story of an overlooked soul, an overweight servant woman who labors to keep house during the day, and then she trudges down the cobblestone streets to spend her pennies on art supplies so that she can paint by night. 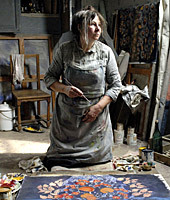 Séraphine paints for the glory of the Virgin Mary, singing as she works. And then one day, she’s discovered by a great German art critic, a man who was influential in bringing Pablo Picasso to fame. What happens next, as war looms on the horizon, is surprising and heartbreaking. And speaking of heartbreak — the Academy overlooked Moreau’s phenomenal performance, preferring the work of box-office superstars like Sandra Bullock. The film, which won seven Césars (including best film, best screenplay, best cinematography, and best actress) is set for a U.S. DVD release in March. For more on Séraphine, read my article at Image. You can also see the movie trailer of Séraphine. What’s the third great French film of 2009? It’s called The Class, from director Laurent Cantet, and it’s already available on DVD. (Correction: While The Class played briefly in a few U.S. theaters in 2008 in order to qualify for that year’s Oscars, it was not widely seen or reviewed during that time, and did not receive appropriate attention until a wider theatrical release in 2009. That is why it went by almost unrecognized on Oscar night 2008.) Read all about it in the Winter 2010 issue of Response. You can see the movie trailer of The Class now. Editor's note: Check back later this week to read about these other overlooked films: Bright Star, Lorna’s Silence, The Song of Sparrows, Gomorra, The Maid, and Lake Tahoe. Read Overstreet's review of Munyurangabo now. What movie should have been nominated for a 2010 Academy Award, but wasn't? Tell us, and see it posted below. Posted February 26, 2010, at 7:50 p.m. I would like to know more about the film "Summer Hours," and I will look for it on imdb. Most of the movies reviewed in this column sound fantastic! Posted February 11, 2010, at 11:58 a.m.
Sean, thanks for replying. I'm aware of the process. I've also read testimonies from Academy members who have admitted how little time they have to actually watch the screeners they're sent. You're right: The White Ribbon will probably win. But many critics, myself included, think that Michael Haneke has made far better films than The White Ribbon. This one has certain qualities that appeal to Academy members. The Academy *loves* foreign films that have a certain solemn view on the WWII era. Don't get me wrong; I agree with you that it's a fine film, deserving of acclaim. But it's sad that most American moviegoers will look at the television and say, "Who is that guy?" when Haneke wins. He's been one of the world's most important filmmakers for a decade. His film Code Unknown is one of the most extraordinary films I've ever seen, and it never received theatrical distribution in the U.S. (It played briefly in New York, according to IMDB.com.) The Academy Award-winning film Crash was like a version of Code Unknown dumbed down for Americans with heavy-handed, grim-faced moralizing. Posted February 10, 2010, at 3:03 p.m.
Jeff, Academy members are sent screeners of all nominees and potential nominees, those "For Your Consideration" DVDs. I'm sure that most all of the Academy members were able to see The Class. On another note, The White Ribbon, which I think will win Best Foreign Film this year, is one of the most beautiful and intriguing films I have ever seen. Posted February 10, 2010, at 11:17 a.m.
Yeah, that seems to happen a lot with foreign films. "A Prophet" is nominated this year for Best Foreign Film, but it hasn't hit U.S. theaters, yet. I believe its limited release date is February 26, 2010. After I get caught up on some Scorsese films, "Summer Hours" will be up on my movie queue, can't wait. Posted February 10, 2010, at 10:31 a.m. Thank you for the clarification on The Class. It is true that the film was nominated in 2008 ... after a fleeting "qualifying run" in a couple of locations at the end of the year. I should have spent a paragraph on that situation. That kind of treatment never helps a film become well-known to Academy members. If the film had been given a wider release and more attention in time for Oscar voting, I suspect it would have won the Oscar. It is certainly more highly acclaimed around the world than the film that won in 2008. So it is, I believe, another example of how the Oscar voting system is flawed. Here in Seattle, one of America's best movie-going cities, the film didn't hit the big screen or get an official review until almost the end of February 2009. Posted February 10, 2010, at 7:31 a.m. I appreciate this article. On a side note, The Class is a 2008 film, which was nominated for Best Foreign Language Film at last year's Academy Awards. Posted February 9, 2010, at 4:36 p.m.
Technically, Oscar didn't forget about The Class. It was nominated for Best Foreign Language Film in last year's Academy Awards, which it lost to Japan's Departures. Posted February 9, 2010, at 12:16 p.m. I wish Where the Wild Things Are had gotten at least one nomination. Such a beautiful sad movie.